Please use the smallest needle possible. 1) Hoop one layer of frame fabric and one layer of a heavy fabric (I used felt). 2) Stitch the first colour. This will be the size of the inner photo frame. 3) Put sticky backing on the back of the photo you would like to use. 4) Use a little adhesive spray or a glue stick and fasten the photo to the frame. 5) Stitch the second colour. 6) Trim the photo if necessary. 7) Stitch the next 7 colours. 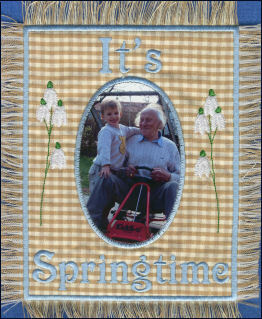 8) Stick another piece of frame fabric to the back of the frame using adhesive spray or a gluestick. 9) Stitch the next colour. 10) Trim the excess fabric from the back of the frame and stitch the last colour.